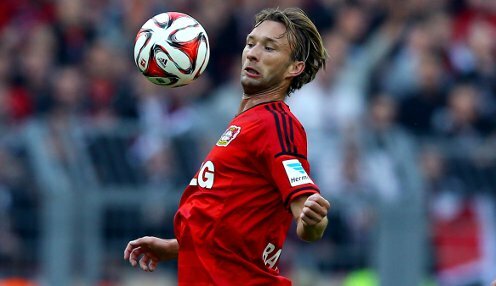 Bayer Leverkusen captain Simon Rolfes will undergo surgery on a ligament tear in his right ankle and will be sidelined for "some weeks", the club have said. The North Rhine-Westphalia outfit confirmed on Thursday that the influential 32-year-old will need an operation on the injury he suffered in the 4-2 Bundesliga win over Hertha Berlin on Saturday at BayArena. The Ibbenburen-born midfielder was replaced on 68 minutes by Stefan Reinartz after a challenge with Hertha's Peter Niemeyer and the club revealed he will now go under the knife. "In consultation with the medical department of Bayer 04 it was decided after considering all options to follow an operative procedure," a statement on the official club website read. "This is obviously very frustrating for me but I will do everything to get back as quickly as possible," added Rolfes. Roger Schmidt's men have made a strong start to the season, winning both Bundesliga games and demolishing FC Copenhagen 7-2 on aggregate to book a spot in the Champions League group stage. They also thrashed Alemannia Waldalgesheim 6-0 in the DFK-Pokal at Stadion am Bruchweg in Mainz earlier this month. Bayer 04 have been drawn in Group C in qualification for Europe's premier club competition, along with Benfica, Zenit St Petersburg and Monaco. The club's opening Champions League group game in on 16th September when they travel to Stade Louis II to take on Ligue 1 big-spenders Monaco. Bayer Leverkusen are currently priced 1/1 in the Champions League Group C group qualification betting.